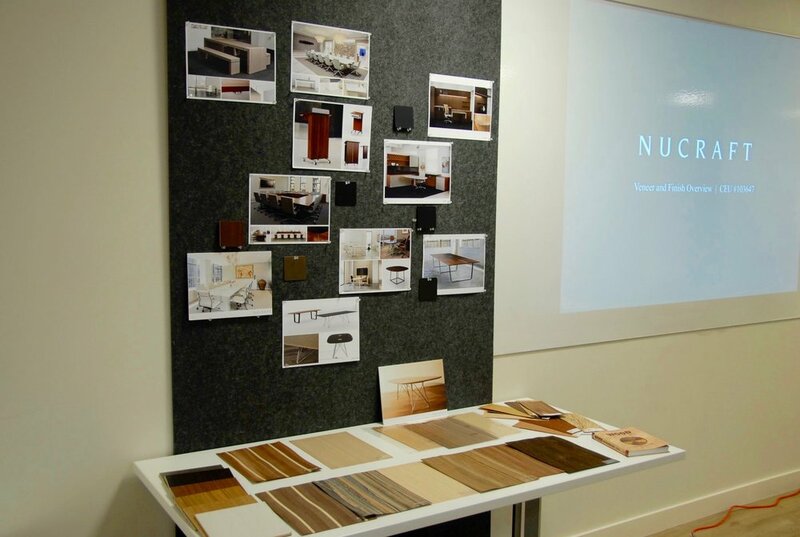 During the Nucraft CEU event we hosted in Vancouver last fall, we learned all about veneer from Nucraft's Abigail Heijboer. From the buying process to different species and qualities of wood used to the layup methods, there are many factors that contribute to the final look of each wood veneer product. Only 1 out of 150 trees can be used for veneer, and high-end manufacturers like Nucraft select from the top 10% of that. Most veneer is priced between 30 and 50 cents per square foot. Once a palette of veneer is purchased and brought to a plant for use, the industry's standard is to get 30% yield. At Nucraft, waste products are re-used. Some is chopped and made into fire blocks, while some is turned into sawdust and wood shavings that local farmers pick up and use for their animals and land. When considering what species will fit a project, there are so many factors to consider: graining pattern and uniformity, porousness, cathedraling, appearance of defects, hardness. "Defects" - or what can also just be considered natural characteristics - can include mineral streaks, pin knots and burls. Generally, these are avoided in higher grade veneers to achieve a more uniform look. However, some customers specify defects to achieve a more organic or natural look. The grade of veneer affects the likelihood of defects in the wood. The hardness of the wood is another factor that plays a big part in how the final product will appear, both over time and with use. A softer wood will easily mark when a pen is used on paper, while a harder wood might be more difficult (though blotters are always recommended with natural wood products). Enter the Janka Hardness Scale. This is a tool used to measure the hardness and durability of different types of wood. It measures the hardness of wood by how much force is needed to embed a steel ball halfway through a piece of wood. Maple is a popular veneer used by Nucraft that is a harder wood, while cherry and white oak are popular softer wood options used. Another factor that impacts the final product is the slicing and layup method used. The most common slicing methods for furniture veneer is plain slicing (or flat cut), though rift cutting is also often used with white oak. Flat cutting takes a slice parallel to a line through the centre of the log and gives you straight grain on either side with a cathedral in the middle. Rift cutting is sliced off the radius line so there are only angular lines from the grain, with no cathedraling. Veneer layup refers to how to consecutive pieces are sequenced one after the other. A common layup method used is slip matching, a process where adjoining leaves of veneer are slipped next to one another, so the same face side and graining is repeated. Book matching is the process of taking two adjoining pieces of veneer and flipping them open like the pages of a book. Slip match is Nucraft's default layup process, but they also use book match, plank style, chevron or other layup patterns as requested or specified by the product. These methods can be selected to create very different looks, affected by consistency of grain features, highlighting or masking of natural characteristics. Just like the credenzas below, the various woods and production methods can help a piece become casual, elegant, business-like or any other statement a client wants to make. Just like walking through a forest among so many different trees, each and every final product made with wood veneer will be unique based on different factors, just some of which are described above. With thanks and source credit to Abigail Heijboer, CEU Presenter, and all of the experts at Nucraft. To learn even more about veneer from the experts, read Nucraft's Veneer + Finish Training Manual.